2018 sees Air + Style coming to Sydney and with over 60 of the world’s top male and female snow elite, it’s one event you’ll want make sure you score tickets to. 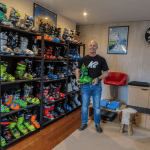 Ski and snowboarding’s dominators will compete on a 16 storey ramp in Sydney’s Domain (yes, the one in the city without naturally occurring snow!). This year is the first time skiing has been added to the mix. The majority of competitors will have competed at the Winter Olympics in Korea and if they score a round win at Air + Style Sydney, will go on with the chance to score a massive prize pool on the Global Tour. ?? Air + Style is a global Big Air snowboarding and skiing comp that spans across music, tech and fashion. Over three days, the Domain will be turned into an incredibly fresh festival unlike anything Sydney has seen – big air, big fun and the biggest snow ramp ever built in Oz!? ?